The movie Cake follows the main character Clair (played by Jennifer Aniston) as she struggles with chronic pain that was a result of a bad car accident. Yet despite time and physical therapy Clair doesn’t seem to make any progress toward healing. At one point her physical therapist asks her: “Do you WANT to get better?” to which Clair does not have a clear answer. As her story gets told we discover that she is not only dealing with physical pain, but also with death of her child and her own survivor’s guilt. So her physical pain was truly a reflection of her deep emotional wounds. Until she was willing to face her inner struggles, her physical or emotional healing was not possible. The yoga tradition says that humans are multidimensional beings and when problems arise they usually show up on multiple levels. 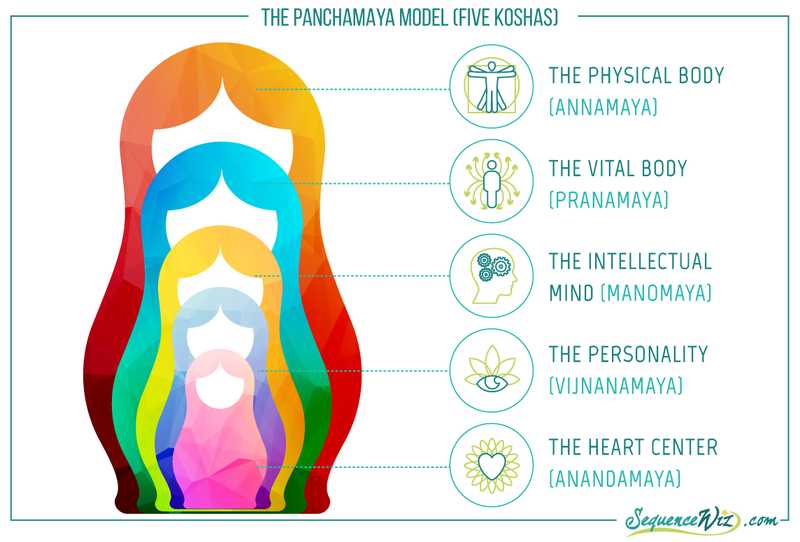 The five layers of the human system (or five koshas) are sometimes illustrated similar to nesting dolls, one fitting neatly inside the other. The physical body is the most obvious external dimension; hiding inside it is the layer of energy and physiology, then the layer of intellect, then personality and the deepest of all is the layer of joy. This is a rather simplified view of our multidimensional selves, of course, as those layers are not separate from each other. 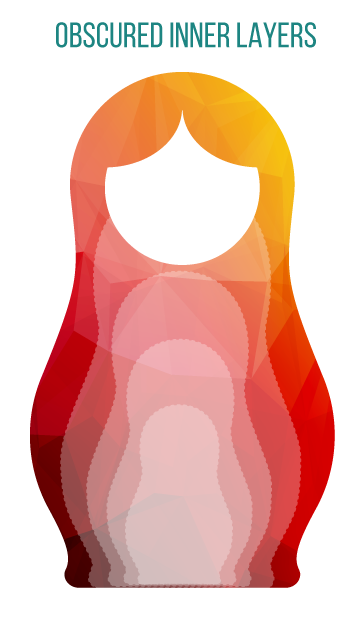 But this representation illustrates one important point about the Panchamaya model: the external layers can obscure what’s happening on the inside. If you experience physical symptoms of discomfort, it is tempting to try to figure out the cause on the level of physical body, but it might be deeper than that. For example, if you have ongoing stomach issues it might be related to drinking too much coffee, or it might be connected to the low-grade anxiety that you are experiencing, which might be associated with your recent fall, which reminds you of your mother and how fragile she became at your age, and so on. So whatever is happening on the level of physical body might have roots in the deeper layers of your system. Unless you examine those deeper layers, you are bound to tinker with symptoms rather then addressing the source of the problem. You won’t know what the source of your chronic issue is until you dig deeper, and the best way to dig deeper is through meditation. The teachings and practices of meditation are fundamentally about training your ability to direct and maintain attention, not about achieving the blank mind. We can use meditation to develop concentration skills, deepen our focus and let go of mental chatter. But ultimately meditation enables us to see our deep patterns of thoughts and behavior that impact our physical bodies, our energy and physiological functioning, our interactions and our relationships, and our happiness. Through meditation we are able to gain access to deeper dimensions of our systems (that are usually obscured by stuff happening on the surface) and AFFECT THE DIRECTION OF CHANGE that our bodies and our lives go through. Over the next few weeks we will take a look at what meditation is, how it works and the basic strategies for practicing and teaching meditation. Tune in! Olga, this is by far the absolute best definition/description of “meditation” I have ever heard. PS: Loving your new APP!!! Wow, thank you Darlene! And so happy to hear that are enjoying the app! Love your essays on yoga, Olga. Olga, I love that movie…also love your site, and your little chart on meditation. short and sweet! This is another wonderful piece of writing, Olga- I have to tell my yoga students about your site. I just bought your yoga journal for myself, and I’m looking forward to using it. Olga, I’ve been enjoying your lessons for about two years now—since I first learned of them/you. Your thoughts and applications are so relevant to the people of today. Thank you for bringing the interpretations of yoga from “mystic” to “meaningful”. The definition of meditation makes much more sense than “emptying the mind.” I mean, who can really do that??? Thank you for your passionate work of sharing. Next story Does yoga have its own approach to meditation?